The Manu Samoa Sevens headed to the Singapore Sevens yesterday hoping to finally break into the Cup playoffs for the first time this year under new coach Sir Gordon Tietjens. After their first two games, that goal will now have to wait. The lack of killer instincts at crucial times, silly mistakes and the team’s inability to make opportunities count saw them sink against Australia and Argentina last night. 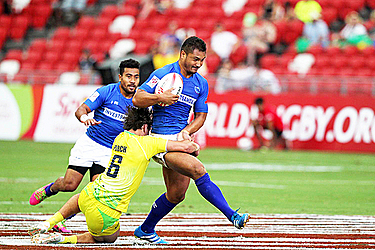 Like last week in Hong Kong, Samoa put up a brave fight against Australia, losing, 19-12 in a game they could have won. Australia hit back again through Simon Kennewell for his second which ultimately sealed the victory for the Aussies. In their second game against Argentina, Samoa was outmuscled. Argentina got off to a flying start with a 10-0 scoreline after two tries. Savelio Ropati pulled one back for Samoa to reduce the gap, 10-7. But that was as good as it got for the men in blue. Argentina went on to score another try to win 17-7. Samoa’s last pool game was against Kenya last night. The result was not available at press time.